Lockjaws are red piranha-like fish that inhabit the waters of Crocodile Isle and Donkey Kong Island. Lockjaws are found in almost all underwater levels of Donkey Kong Country 2: Diddy's Kong Quest. 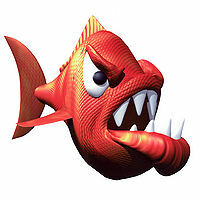 If Diddy Kong or Dixie Kong swim too close to a Lockjaw, the fish clamps its jaws for a few seconds and then lunge at the Kongs, trying to take a bite out of them. Lockjaws can only be defeated with help from Enguarde the Swordfish. They start out attacking slow on the early levels, but they'll attack at a faster speed as the player advances through the game. Lockjaws also appear in Donkey Kong Land 2. In the game their attack strategy is the same as the one used in Donkey Kong Country 2. A Lockjaw is shown on the cover of the game, attempting to attack Diddy, Dixie, and Glimmer the Angler Fish. A pink version of Lockjaw called Snapjaw appears in two of Donkey Kong Country 2's levels. Snapjaws will follow the Kongs throughout these levels and there is no way to defeat them. Lockjaws make a reappearance in the Game Boy Advance game, DK: King of Swing. Here, they are rather weaker, capable of being defeated by simply being bashed into by Donkey Kong. Lockjaws also appear in DK: Jungle Climber, where they simply attack Donkey Kong and Diddy Kong by biting them. Lockjaws also appear in Donkey Kong Barrel Blast as rare enemies only found on DK Jungle Falls and DK Jungle Sunset. Here they attack players by jumping out of the water and attempt to bite them. There are also electrified variants of Lockjaws. Both of them can be defeated in one hit, though the electrified Lockjaw will also significantly slow down a player unless that player was invincible. This page was last edited on November 20, 2018, at 14:58.